Mangaluru, June 29,2017 : Pejawar Swamiji Sri Vishwesha Theertha has done nothing wrong by organising an Iftar Koota aimed at fostering harmony and brotherhood, said State Vice President of BJP Minorities Morcha Rahim Uchil who was also one among the several Muslims who had attended the Iftar meet hosted by the Swamiji. Speaking to reporters here on June 29, Thursday, Rahim Uchil said there had been neither objection nor protests when inter-faith programmes were held in mosques in the past and many Hindus too attended. Stating that he fully supported the Pejawar seer, Rahim Uchil also described the seer as a great guiding force who should be treated with great respect. 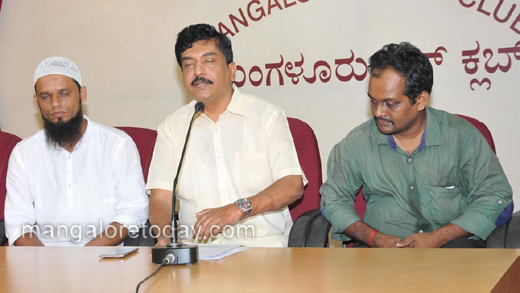 On the protests planned by Sri Rama Sene Chief Pramod Muthalik and some organisations in Udupi as well as Mangaluru, Rahim said it was instigated by jealousy and aimed at creating disharmony in the society. Pointing out that many including BJP leaders Jagadish Shettar, D V Sadananda Gowda, Pratap Sinha, JD(S) State Chief Kumaraswamy and Social Welfare Minister Anjaneya have come out in support of the Swamiji, Rahim Uchil hoped that the organisations would withdraw their decision to hold the protest.